Although spring lawn care gets all the attention, fall lawn care is the make-it or break-it season for grass. Fall lawn care is no walk in the park. It’s hard work, and Dillon guides you through the four basic steps. Aeration gives your Lexington lawn a breather in autumn and provides room for new grass to spread without competition from spring weeds. Aeration tools pull up plugs of grass and soil, breaking up compacted turf. That allows water, oxygen, and nutrients to reach roots, and gives seeds room to sprout. A hand-aerating tool ($20), which looks like a pitchfork with hollow tines, is labor-intensive and meant for unplugging small sections of grass. Gas-powered aerating machines (rental, $20/hour) are about the size of a big lawn mower, and are good for working entire lawns. Bring some muscle when you pick up your rental: Aerating machines are heavy and can be hard to lift into your truck or SUV. Fall, when the soil temperature is about 55 degrees, is the best time to seed your Lexington lawn because turf roots grow vigorously in fall and winter. If you want a lush lawn, don’t cheap out on the seed. Bags of inexpensive seed ($35 for 15 pounds) often contain hollow husks, weed seed, and annual rye grass seed, which grows until the first frost then drops dead. Splurge on the good stuff ($55 for 15 pounds of Kentucky Bluegrass seed), which resists drought, disease, and insects. A late fall fertilization — before the first frost — helps your grass survive a harsh winter and encourages it to grow green and lush in spring. Make your last fertilization of the year count by choosing a product high (10% to 15%) in phosphorous, which is critical for root growth, Dillon says. 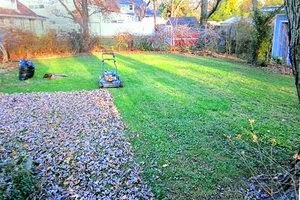 Instead of raking leaves, run over them a couple of times with your mower to grind them into mulch. The shredded leaves protect grass from winter wind and desiccation. An added bonus — shredded leaves decompose into yummy organic matter to feed grass roots. A mulching blade ($10) that attaches to your mower will grind the leaves even finer.